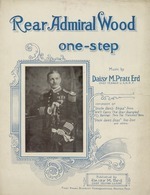 A single piece of sheet music (Daisy M. Erd - First Naval District Headquarters - Publisher, Boston - 1918) with music ("One-Step") by Daisy M. Pratt Erd (Chief Yeoman U.S.N.R.F. - Composer of UNCLE SAM'S SHIP, We'll CARRY THE STAR SPANGLED BANNER THRU THE TRENCHES and others"). Cover image: A photograph of Rear Admiral Spencer S. Wood by an unknown photographer. Uncle daam Ships" Soc,'. tile'!! Carry The Star Spangled Banner Thru The Tren che s"Son. Uncle &Adrn's Ships" One -3rEP. F. NAVAL D s T EAD 4J ...ARTERS, BOSTON, A S.
er Am ow i w "
E l --- --- - -- -- "
%.7 6. 1 gal.- . CHORUS Chief Yeoman US. N. RF.